Raisins and almonds have been the favorite foods of many throughout history. Both are nutritious foods that can be stored for long periods of time and are easily transported -- attributes that would have made them valuable in ancient times. 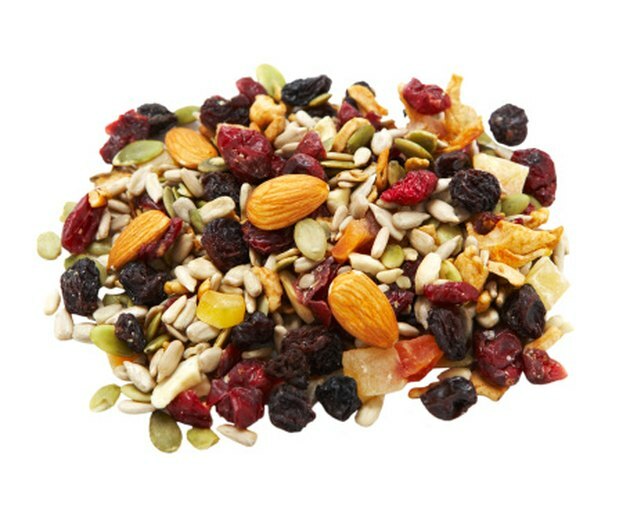 Raisins and almonds are nutritious, portable snacks that make good additions to your family's lunch boxes. You can also add them to salads, stir-frys, rice, eggs, baked goods and other recipes. A quarter-cup serving of raisins has 120 calories. This serving counts as a half-cup of fruit under the United States Department of Agriculture's My Plate guidelines. They recommend 1 to 1 1/2 cups of fruit each day for children and 1 1/2 to 2 cups for teens and adults. A 1/2 oz. serving of almonds -- approximately 12 almonds -- has 90 calories. This serving counts as 1 oz. in the proteins group, according to the USDA's My Plate guidelines. They recommend 2 to 4 oz. of proteins for children ages 2 through 8 and 5 oz. for children from 9 through 13. Recommendations for teens and adults are 5 to 6 1/2 oz. per day. A serving of raisins contains 1 gram of protein, while a serving of almonds contains 3 grams. Raisins are fat-free, but almonds are fairly high in fat at 7 grams per serving -- 12 percent of the recommended amount for a 2,000-calorie diet. Most of this fat is monounsaturated fat. Monounsaturated fat is considered to be a "good" fat because it can improve cholesterol levels and has anti-inflammatory benefits. As with all foods from plant sources, both raisins and almonds are cholesterol-free. A serving of almonds contains 1 gram of sugar and 2 grams of dietary fiber. A serving of raisins contains 2 grams of fiber as well, but it also has 24 grams of sugar. Dried fruit is a concentrated version of the fresh fruit from which it's made, so it is often higher in sugar and calories, which it's why it's so important to limit your consumption. It takes 1 cup of grapes to make a quarter-cup serving of raisins. A serving of raisins contains 2 percent of your daily recommendation for vitamin C, based on a 2,000-calorie-per-day diet. It also has small amounts of all the B-vitamins except for B-12, which is found in fortified foods or foods from animal sources. A serving of raisins has 2 percent of the daily recommendation for calcium, 4 percent of the daily iron recommendation and small amounts of potassium, copper, manganese, sodium and fluoride. A serving of almonds contains about two-thirds of the daily adult recommendation for vitamin E and small amounts of the B-vitamins (except for B-12). A serving of almonds contains 4 percent of the daily value of calcium and iron, as well as small amounts of potassium, zinc, copper and manganese. Nuts in their natural state are sodium-free.